Many thanks to Karen of Pinnigirl to donating this adorable dress and handbag set as a giveaway prize to one lucky winner here on BlytheLife.com! If you didn’t win, you can always pop over to Pinnigirl on Etsy and buy yourself a consolation prize. Click to read more of this entry. Without a doubt, Pinnigirl is charming. I was drawn to the bright colours and retro prints when Karen contacted me about her shop, Pinnigirl. It’s perfectly fun and I had a great time getting to know the woman behind the brand! Hi Karen! Tell us a little bit about yourself. Hello Michelle and all my fellow Blythe enthusiasts. I am Karen and I live in Sydney, Australia. I am a passionate (some would say obsessive) handcrafter and have experimented with most crafts involving a needle, but have my favourites such as sewing and knitting, although also love stumpwork, hardanger, embroidery and needlepoint to mention but a few. I am at my happiest when I am learning something new, as I am always up for a challenge. Since founding Pinnigirl my skill set has expanded to include blogging, jewellery making, photography and managing my Etsy shop. How did your discover Blythe? Who is in your doll family right now? It is thanks to my sister-in-law Jana, that I was introduced to the world of Blythe. She is an avid collector, and I was inspired to sew for Blythe whilst viewing her wonderful collection. My first attempts were very rudimentary and I was a bit disheartened as I am an advanced sewer and surely sewing these little outfits can’t be that difficult, can it? I left it for a few months, and then one day whilst cruising the web, I stumbled across the world of Silkstone Barbie and my jaw dropped when I saw these magnificent outfits. 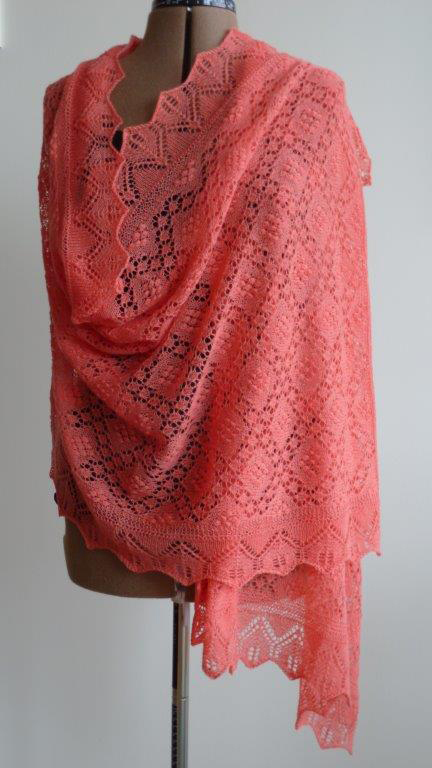 I repeatedly visited the website Matisse Fashions by Brenda Visaya and studied her tutorials. The penny dropped! 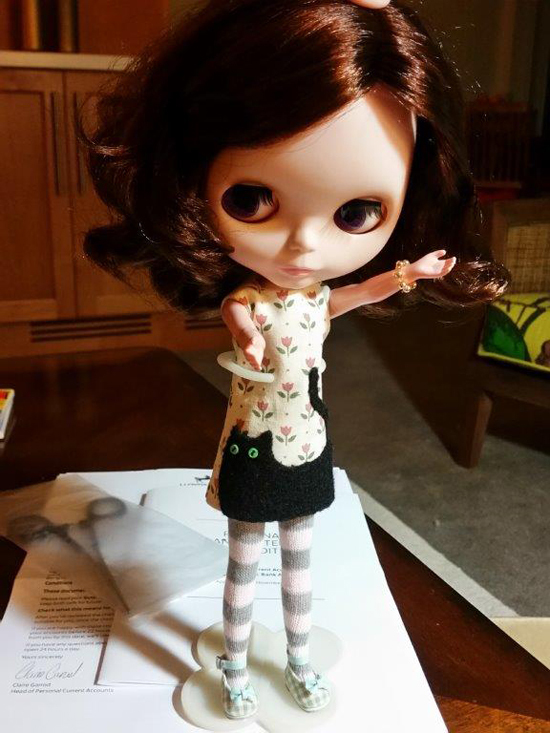 I hastily found a Blythe pattern online and with my newly acquired knowledge, made my first successful Blythe dress. Jana was delighted and with her encouragement the idea of Pinnigirl was born. I now have five Blythes, two are factory girls and three the real McCoy – Bling Bling Party Fur, Raspberry Sorbet and Kiss Me True. This is no means the end of the family though, as I am continually looking to see whom to add! I am in love with Fashion Obsession Jenna but she is very pricey so will wait for a release which has the same looks. 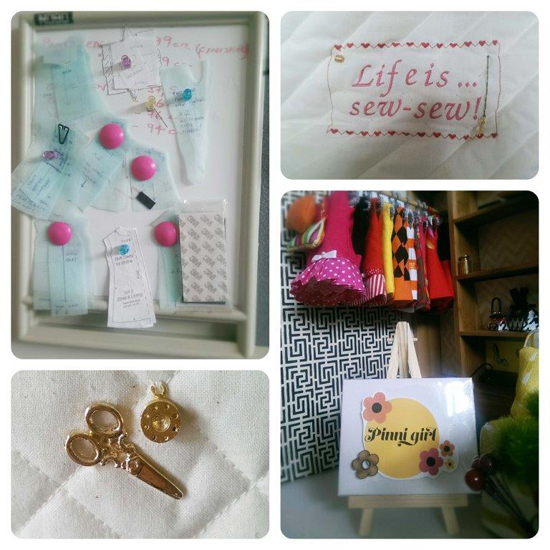 What can you tell us about your shop, Pinnigirl? Armed with my desire to create for Blythe, I began to research what clothes were being made for Blythe and thought it would be great fun to make the fabulous retro clothes of the mid to late 1960s. I then decided that I wanted to share my retro outfits with others and opened my Etsy shop. I have discovered that I wish to offer more than just a dress, and more of an outfit which will include handbags and jewellery to match. All of the clothes are fully lined, including the trousers which I haven’t yet included in the shop. My late husband gave me the nickname Pinnigirl, and not only does it evoke great memories, but is a living tribute to a wonderful man. He sadly passed away two years ago after a short battle with cancer. He would have been delighted by all my endeavours to make Pinnigirl fly. Tell us about your first sale experience! What went through your head? Was it hard to let the piece go? The first sale I had was for the ‘Bee Dress’. It is a yellow A-line dress with a side panel in black and white stripe. I had a little twinge when it went, but I was so delighted by the buyer’s response to it that any qualms I may have had were soon dispersed! I think it’s really neat that you make matching accessories! 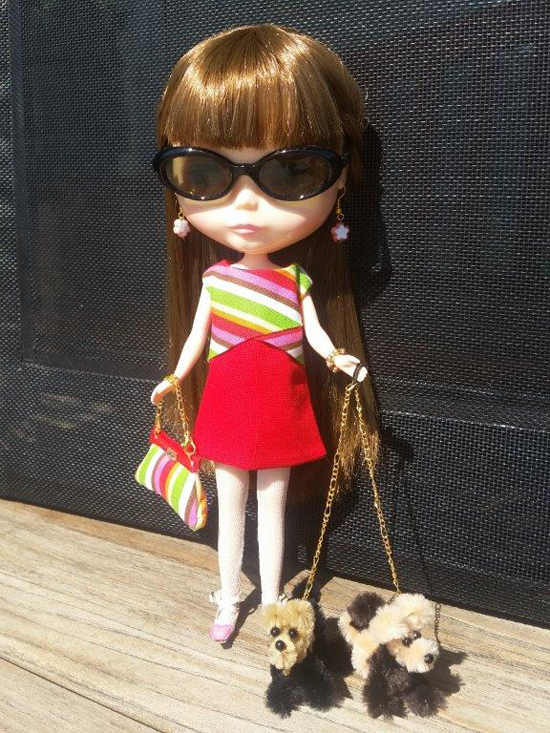 What would you say is your most favourite type of accessory to make for Blythe? Do you ever make something big so you can match your dolls? I get carried away with whatever it is I am making. When I visit the hairdresser I have my mobile at the ready and take photos of the glossy magazines which have pages of gorgeous handbags or jewellery for me to emulate. I also trawl Pinterest which is a goldmine of information and resource. I enjoy the challenge of thinking outside the box and ‘seeing’ what I can make for Pinnigirl. I have saved loads of empty matchboxes and mint tins to turn into suitcases. I enjoy making Blythe bling and usually leave the jewellery making for the evenings when I am plonked in front of the tv, and will have one of my girls in her latest outfit and eager to model, my box of tricks at my side and just let the creative juices flow. If it is something that requires stitching, I will make a sketch and leave it to the next day to stitch as I prefer sewing in daylight. I have been known to sketch designs on the back of my music whilst at choir! How has a background in so many crafts helped you with your Blythe endeavours? I have a portfolio of designs for Blythe. When I look at each design I will imagine how I am going to interpret it at 1/6 scale, what technique I could apply and will envisage what it will look like on Blythe. I will go over the construction in my head, and often will resketch the design to simplify it or see if indeed it is feasible. I often get asked about how I know about products such as bondaweb or solvy for example, which I discovered when doing stumpwork. I am continually exploring techniques and learning about products or methods. I read a lot about quilting methods because much of this is applicable to what I am doing at Pinnigirl and they have wonderful tools for sewing. A good example would be the dress called ‘Mellow Yellow’. 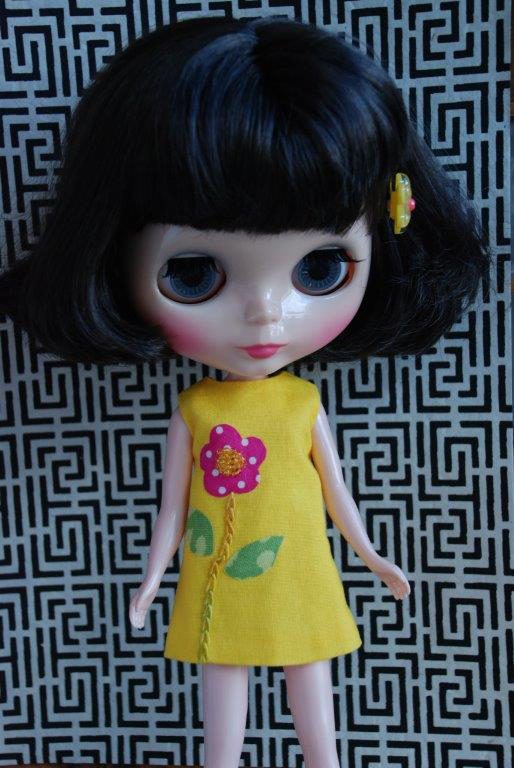 This dress is based on a design I saw and thought ideal for Blythe. It is a yellow dress with appliquéd bondaweb flower and leaves on the front. The centre of the flower is beaded, the stem is embroidered in chain stitch in a hand dyed thread. What made you decide on retro style clothing for Pinnigirl? I looked through pages and pages of Blythe outfits for sale and noticed that most followed a particular style of being cute little girl dresses of a similar pattern, or the tomboy look of dungarees and t-shirts. I fancied another look and thought that the fashion of the mid to late 1960s suited Blythe’s Twiggy-type body and her ‘flat footedness’. I have made a conscious decision to line most things in white as Blythe is prone to staining. Whilst a prewash may eliminate some surface dye it is hard to guarantee that an item is colourfast. I have several items of clothing which are now years old and still bleed when washed. What would you say is the hardest thing about crafting for Blythe? Crafting for Blythe is fiddly, no doubt about it! Everything is fiddly, dressing her, taking photographs, and of course sewing her outfits. Tell us about what a normal day is like for you when it comes to creating for Pinnigirl. I am an early riser, so my Pinnigirl day has an early start too. I think I have mentioned that I like to sew during daylight hours. I have my craft table set up in front of floor to ceiling windows, so get fabulous light in my studio. I turn on the radio, and get right into my planned outfit. I always start my day knowing what I am going to create as I do my planning the night before. When the dress and accessories are complete, I then dress one of my darling girls and experiment with the look I am wanting to create. I carry the photography over to the next morning when the light will be right. When I finish my working day I tidy up completely, packing everything in its place, and vacuum so I can start the next day with a clean slate. What do you have planned in the future for you and Pinnigirl? I have only had my Etsy shop for two months, so at the moment my focus is on getting known. There has been a lot to do besides just making stock. I would like Pinnigirl to build a solid reputation for quality, fun outfits and be the ‘go to’ boutique for clothing Blythe. Thank you so much for doing this interview with me, Karen! 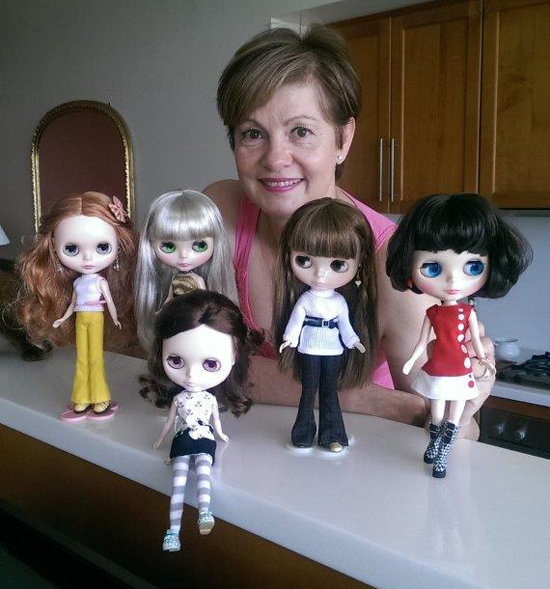 What advice do you have for someone who’s new to crafting for Blythe? Patience is very important as you have to be in the right head space otherwise you will drive yourself crazy. Accuracy is also key. You are cutting out tiny garments and sewing tiny seams so there is no margin for error. Most of all, enjoy what you are doing and have fun! You can find out more about Karen and Pinnigirl on pinnigirl.com, Etsy, and Instagram.